According to the TV news, an extremely cold Arctic outbreak had spread across the eastern half of the United States, dropping temperatures to -25°F in Chicago and near 0°F in Atlanta. There was a major freeze in the central Florida citrus groves. At National Airport, the temperature dropped to 2°F. There was a one-hour period during the early afternoon when the snow dropped visibility at National Airport to a sixteenth of a mile. Approximately 2-to-3 inches of snow fell during that hour. Then, the snow ended abruptly in the mid-afternoon. The Air Florida’s scheduled departure time was delayed about 1 hour and 45 minutes because of the temporary closing of Washington National Airport. Moderate snowfall continued and the air temperature was 24 °F. The plane had trouble leaving the gate when the ground services tow motor could not get traction on the ice. For approximately 30 to 90 seconds, the crew attempted to back away from the gate using the reverse thrust of the engines, which proved futile. Boeing operations bulletins had warned against using reverse thrust in those kinds of conditions. Eventually, a tug ground unit properly equipped with snow chains was used to push the aircraft back from the gate. After leaving the gate, the aircraft waited in a taxi line with many other aircraft for 49 minutes before reaching the takeoff runway. The pilot apparently decided not to return to the gate for reapplication of deicing, fearing that the flight’s departure would be even further delayed. More snow and ice accumulated on the wings during that period, and the crew were aware of that fact when they decided to make the takeoff. Heavy snow was falling during their takeoff roll at 3:59 p.m.
At 4:01 p.m. EST, it crashed into the 14th Street Bridge across the Potomac River, 0.75 nautical miles (1,390 m) from the end of the runway. The plane hit six cars and a truck on the bridge, and tore away 97 feet (30 m) of the bridge’s rail and 41 feet (12 m) of the bridge’s wall. 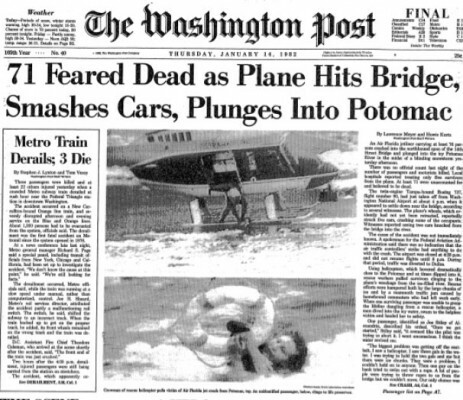 The aircraft then plunged into the freezing Potomac River. It fell between two of the three spans of the bridge, between the I-395 northbound span (the Rochambeau Bridge) and the HOV north- and southbound spans, about 200 feet (61 m) offshore. All but the tail section quickly became submerged. Meanwhile, at 4:29, the subway system (Metro) suffered its first fatal crash at the Federal Triangle station. Air Florida Flight 90 was a scheduled U.S. domestic passenger flight from Washington National Airport to Fort Lauderdale – Hollywood International Airport with an intermediate stopover at Tampa International Airport. 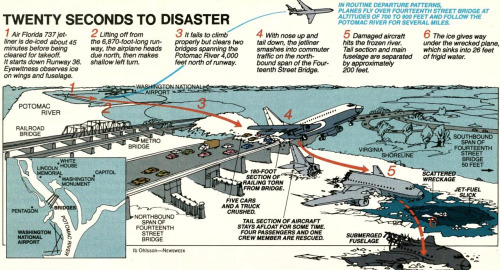 On January 13, 1982, the Boeing 737-200 registered as N62AF, crashed into the 14th Street Bridge over the Potomac River. The aircraft had originally been purchased by United Airlines in 1969 and flown with the registration number of N9050U. It was sold to Air Florida in 1980. The aircraft struck the 14th Street Bridge, which carries Interstate 395 between Washington, D.C. and Arlington County. It crushed seven occupied vehicles on the bridge and destroyed 97 feet (30 m) of guard rail before it plunged through the ice into the Potomac River. The crash occurred less than two miles (3 km) from the White House and within view of both the Jefferson Memorial and The Pentagon. The aircraft was carrying 74 passengers and five crewmembers. Four passengers and one flight attendant survived the crash. Four motorists from the bridge were killed. The survivors were rescued from the icy river by civilians and professionals. President Ronald Reagan commended these acts during his State of the Union speech a few days later. The National Transportation Safety Board (NTSB) determined that the cause of the accident was pilot error. The pilots failed to switch on the engines’ internal ice protection systems, used reverse thrust in a snowstorm prior to takeoff, and failed to abort the takeoff even after detecting a power problem while taxiing and visually identifying ice and snow buildup on the wings. Major real-life air disasters are depicted in this TV series. Each episode features a detailed dramatized reconstruction of the incident based on cockpit voice recorders and air traffic control transcripts, as well as eyewitnesses recounts and interviews with aviation experts. Sometimes, interviews with investigators who dealt with the disaster or even actual footage are featured. In Canada, where the series originated, the show is called ‘Mayday’. In the US it is ‘Air Emergency’. Everywhere else it is called ‘Air Crash Investigation’. ← Happy New Year from the Tom O’Connor Group!